Have you heard? You may now link your Paymaya account with Facebook Messenger and enjoy the convenience of online shopping while speed-chatting on this leading messaging app! Holy guacamole! 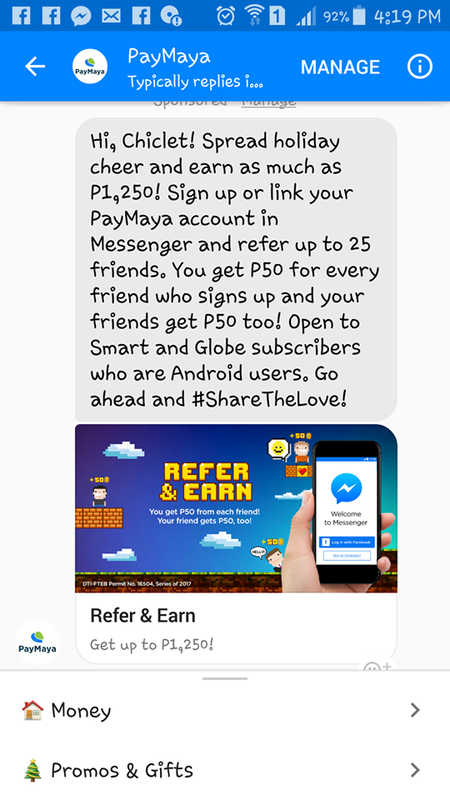 PayMaya recognizes that Facebook Messenger's community offers a unique opportunity to make PayMaya services available and accessible to even more users. Galing! I've already linked my Paymaya account to Messenger and I have already used it to pay my telephone bill in just a tap of my finger! Viola! No mahabang pila, no stressful linya. Just Payamaya in my messenger and my bill is settled like bongga! But wait, there's more! With Paymaya and Messenger, you don't just enjoy the convenience of transforming your mobile phone into a virtual wallet, you also get to enjoy discounts and other freebies! You can buy load from #PaymayaInMessenger and enjoy 5% discount ( no need to go to your nearest sari-sari store to top up ) You can buy load from P20-P1000. Yap! You got that right! 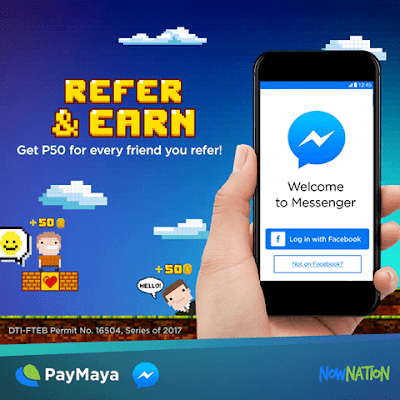 You can earn as much as P1,250 just by inviting friends to link their paymaya accounts to messenger. Earn P50 for every friend you refer to open a PayMaya in Messenger account! Your friend gets P50, too! Wow! What a cool way to #SharetheLove. Want to earn this much , too? Read the promo mechanics below. But remember, if Cinderalla's magic only lasted till 12mn, this promo on the other hand runs only till December 19, 2017 so don't waste time and hurry, hurry! If you don't already have a Paymaya account, then by golly get one na. Now na, start earning na, #PaymayaMoNow na! Meanwhile, I've got some Santa Chix job to do....gonna give someChristmas cheers to 5 lucky persons who will be liking and sharing my posts on social media. Tapos ka na bang magbasa? Aba, like and share na rin, because this Chix is giving away P1000 Paymaya Credits on December 20th! Thank you for joining and goodluck! Thank you for joining Poy! Goodluck!